A father-and-son team challenge industry giants by focusing on picture-perfect quality and user friendliness for their photo sharing and printing site. Any company that's ever been an underdog knows how daunting and risky the position can be. That's especially true if you're going head-to-head with the likes of Kodak, Yahoo! and Microsoft. Yet Chris and Don MacAskill took on this challenge when they established SmugMug, a photo sharing and printing site that had to set itself apart from its big-name competition. While those other sites were offering sharing and storage services to users at no cost, SmugMug was planning to charge a subscription fee at a time when many other internet companies were falling apart. And nearly everyone thought they were crazy for doing so. SmugMug, however, planned to take a different approach to its photo services. Instead of emphasizing print products, Chris and Don wanted to focus primarily on electronic sharing. In addition, SmugMug would create attractive presentations for users' photos, eventually including customizable photo pages, high-quality images, video clips and even slideshows that could be embedded in message forums or blogs. SmugMug would also safely store users' photos without resizing, altering or deleting them from inactive accounts. "Our philosophy is you have to somehow astonish your customer, really surprise them, take their breath away," Chris says. "Then they start referring people. If you just do what's expected, you're like everybody else." The gamble was worth it. Since launching in fall 2002, SmugMug has grown from five customers in its first month of operation to more than 300,000 paying subscribers. 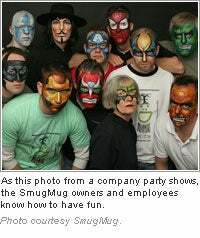 On top of that, Chris says SmugMug has experienced a growth rate of 80 percent every year and estimates $20 million in profits for 2007. Not bad for a company co-founded by someone whose original career had nothing to do with the computer industry. After leading a nomadic life as a geophysicist, Chris moved his family to Silicon Valley to pursue a career in the computer industry after urging from his son. He then launched a few online businesses with varying degrees of success, including Adventure Rider in 2001, following several computer-related stints. Adventure Rider, an online message forum, offered motorcycle enthusiasts a place to share their experiences from their global bike travels. But despite the good reception, there was still something lacking: Users needed a place to post their photos that would allow embedding in the forum. 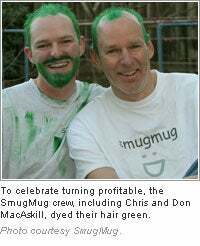 A year later, SmugMug was born, co-founded by Chris and Don with startup costs of about $200,000. Initial support came from Adventure Rider users who were excited about using the new site for their photos. SmugMug now offers several accounts that vary in their customization capabilities and features, including a professional account that allows photographers to set prices on their photos, with SmugMug charging 15 percent of the sale. The account even enables users to upload pictures onto SmugMug under their own domain name, a tool that has been used in political campaigns for Howard Dean, Barack Obama and Jesse Jackson, Jr. Adding to the unique nature of SmugMug are the seven MacAskills working for the company, bringing the employee total to 29. Chris' children run various aspects of the company, from testing to customer research, while his wife handles the accounting. "It just turns out to be a great lifestyle for all of them because we're together all the time doing what we love to do," Chris says. "Work is play and play is work"
With all of this success has come the temptation to sell SmugMug to larger companies that have expressed interest. Yet every time they get a proposal, Chris says they always say no without even asking the offering price. The result of this dedication is an overwhelmingly positive response from users. People go to SmugMug for all sorts of reasons, from showing off baby pictures to friends, to troops in the Middle East using the site to share their experiences with family back home. Chris says they constantly receive e-mails from users who are happy that SmugMug is there to keep their photos safely stored, no matter where their travels take them. "It's the most amazing thing to have people's photos and see what they do with them," Chris says.